During warm summer days where everything seems heavy and sticky, water-based foundations are perfect because there are lightweight and act as moisture control. There are lots of water-based foundations that are full of potentially harmful chemicals on the markets. And YES, there are also some great non-toxic water-based foundations for us. Yeahhh! The foundation I used for my makeup is from Ecco Bella. This is their FlowerColor Natural Liquid foundation. It is a water-based, vegan, and gluten-free made with organic aloe vera foundation and natural sugar. It contains non-nano titanium dioxide which is the non-toxic kind of titanium dioxide. Make sure that your cosmetics that contain non-nano particles. Nano particles are potentially linked to cancer. When I sweat this Ecco Bella foundation holds up great. It feels as if all the moisture does not affect my makeup. It is a water-based foundation, so it is great for these warm and muggy summer days. It is a lightweight and breathable foundation. It perfectly concealed my skin and gave me an even tone skin without feeling heavy. For those with oily skin this foundation is fantastic in the summer because it acts as a moisture control, so the makeup stays on with no shinny feel. It has a runny consistency; that's the normal water-based foundation consistency; don't get put off by it. Ecco Bella has seven colors for this foundation; it covers all skin tones. Where to shop for it? I purchased mine on Amazon.com. 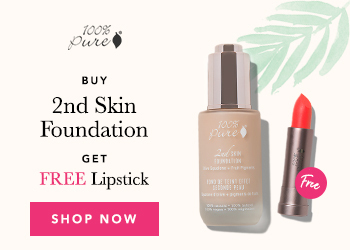 Click here to shop for this foundation. It will cost you $28 on Amazon and will last all summer. Great deal for a non-toxic foundation. The first time I used this Ecco Bella foundation I used a foundation sponge blender. What a mistake! The sponge absorbed all the foundation. Use your fingertips; you can also use a brush if that's less messy for you. I used my fingertips; it was much easier for me. Just put a very small amount on your fingers. Be careful, since this is a water-based foundation, it is a little runny, so just squeeze the bottle a little. The coverage will be on the lighter side after the first application so apply a second layer for full coverage. Another way to use it is to add few drops of the foundation with your moisturizer before applying on your face. It will leave a gorgeous glow. If you are using the brush, just apply it slowly to your face by blending it with circular motions. It dries out fairly quickly.